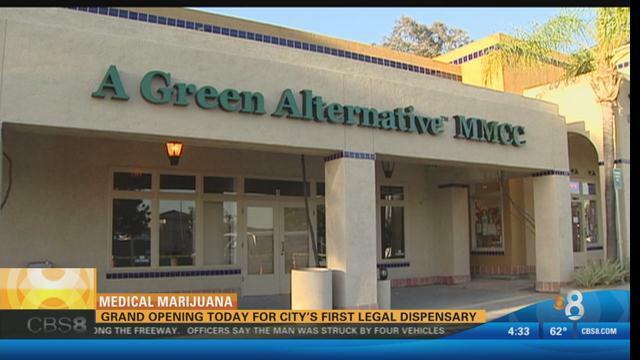 SAN DIEGO (CNS) - The grand opening of the city of San Diego's first legal marijuana dispensary is scheduled for Friday morning. A Green Alternative, which had a soft opening Wednesday, is starting business about a year after the City Council approved regulations under which collectives can operate legally. The shop, located in a strip mall in Otay Mesa near the Brown Field airport, is owned by David Blair, who teaches business at San Diego State University. He was given the final go-ahead in January by the city's Planning Commission, which unanimously rejected an appeal by a drug abuse prevention advocate. Commissioner Susan Peerson said A Green Alternative "meets and exceeds" the requirements of its conditional use permit. Opponents contended that the dispensary was being sited in an area with businesses patronized by families with children. The city's regulations require prospective dispensary owners to go through a lengthy permit application process. They also specify zoning and distances to keep the operations away from residences, schools, churches and the like. In the case of A Green Alternative, the neighborhood is zoned "heavy commercial" and includes a fast-food restaurant, a filling station and a warehouse. The Planning Commission recently denied appeals against three other dispensaries, which would be located in Kearny Mesa, the Midway District and San Ysidro.